Several parts of Rajasthan have been inundated and hundreds of people are marooned in the state that has witnessed unusually heavy rain in the last few weeks. However, it would be wrong to attribute this disaster only to rain. The people of Rajasthan did not get a chance to prepare for this event as the state, quite shockingly, doesn’t have a flood forecasting system (FFS). 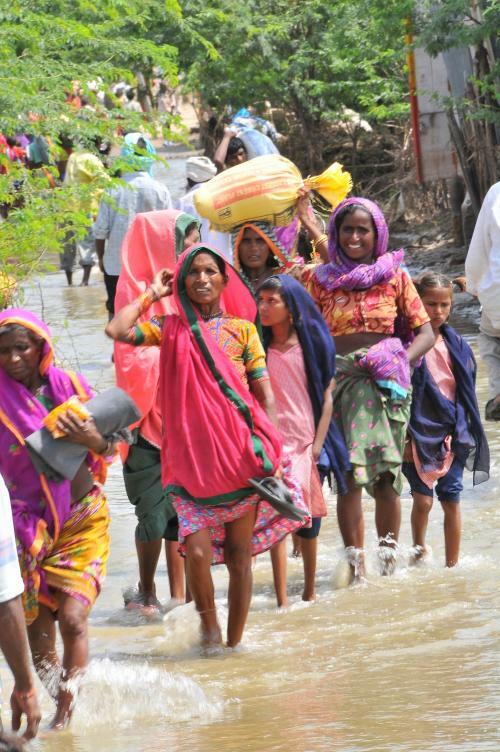 The latest Comptroller and Auditor General (CAG) performance audit report on Centre’s flood control and management schemes has revealed that the Central Water Commission (CWC) has not established any FFS in 15 states/UTs, which include Rajasthan, Andaman and Nicobar Islands, Goa, Himachal Pradesh, Kerala, Lakshadweep, Manipur, Meghalaya, Mizoram, Nagaland, Punjab and Sikkim. In March 2010, the government commissioned work for supplying, installation, testing, commissioning and maintaining 222 telemetry stations, one Earth Receiving Station (ERS) and 10 Modelling stations. The work, which was supposed to be completed by April 2011, ended in June 2013 after delay of 26 months. After scrutinising government records the CAG came to a conclusion that out of 375 telemetry stations, 222 (59 per cent) were non-operational, which means, real-time data was not available from these stations. The reasons for being non-functional are many but some of the worrying reasons are theft of telemetry equipment, dismantling due to inadequate security arrangements. In a curious case of deviating from the norm, the CAG also found that the flood forecasting data was calculated after comparing the telemetry data with manually observed data. Strangely enough, in the case of mismatch between the two sets of data, manual data was adopted. “The CWC did not depend on telemetry data and relied on manual data even after investing in modernisation of telemetry station network for nearly 20 years. This defeated the purpose of establishment of telemetry equipment for meeting the requirement of real time data collection, its transmission and flood forecast formulation,” the report observed. Against a target of the Eleventh Five Year Plan (2007-2012) for installation of 219 telemetry stations, 310 base stations and 100 flood forecasting stations, only 56 telemetry stations were installed as of August 2016 and the rest are in ‘work in progress’ mode. Jhelum, that too after the devastating floods during September 2014. The CWC had installation of 19 additional modernised stations. However, even after nearly two years, no automatic telemetry equipment was installed. The CAG also noted that flood forecasting was not done in some states due to lack of sanction for the scheme and absence of request from state government. Himachal Pradesh is one such state. In September 2014, the Regional Committee for scientific assessment of flood prone area had asked CWC Shimla to take up the matter with the state government to develop a robust flood forecasting system. However, no further progress was made since then.